Legend has it that a group of Spanish explorers, under the command of Francisco Cortes de Sanbuenaventura, the young nephew of Hernan Cortes, were sailing along the coast of Jalisco and the Riviera Nayarit in search of pre-Hispanic treasures and conquests.s. One day, they arrived on the shores of Xiautla, now known as Puerto Vallarta , where they found more than 20,000 natives, holding feathered "banderas" (Spanish for flags) and armed with quivers filled with arrows, ready to defend their land. In response to such a hostile reception, the Spanish prepared to attack. One of the friars quickly got off the boat to greet the natives, taking with him a banner of the Immaculate Conception and the Holy Cross, and knelt before them. It is said that the golden details of the banner calmed the souls of the natives and they put down their weapons. They then proceeded to cover the beach with beautiful flags made of colorful feathers. Thus the area was named Banderas Bay, which commemorates the first meeting of these characters and the blend of history and culture that they brought to the shores of the Pacific Coast where you can go scuba diving, yachting, kayaking and enjoy a variety of other activities. 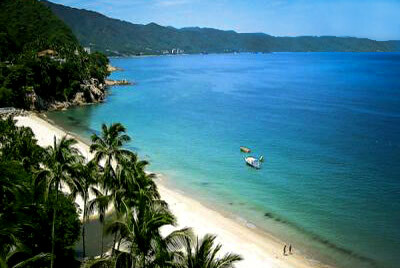 Visit Punta Mita , two beautiful beaches that make up part of the bay.